L’Albatros, which is by Baudelaire. The poem describes how the crew of a ship sometimes would catch albatrosses as they followed the ship. Bringing them on board they would laugh at how the once majestic creature would become comical and ugly in walking. Baudelaire then goes on to liken poets to these birds, a rider or storms, laughing at the arrows of archers, yet once grounded, his giant wings prevent him from walking. I wonder what he meant by that. Perhaps he was implying that a poet is one to wander in the skies, metaphorically, and what allows this flight — in the case of the bird, its wings, and in the case of the poet, the mind — is what hinders them from a normal life on the ground. Either way, as you know, the medium is the message, so let’s do away with all this talk of meaning and talk about the media. I did some calligraphy of a poem! It’s often tempting to do all the fancy things before the boring things. It would be wonderful to use some coloured inks, or gold leaf to spruce up a piece of poetry like this, but the most essential thing in mastering something is to have a good understanding of the basics. That’s why I always make sure to make time for this kind of study. 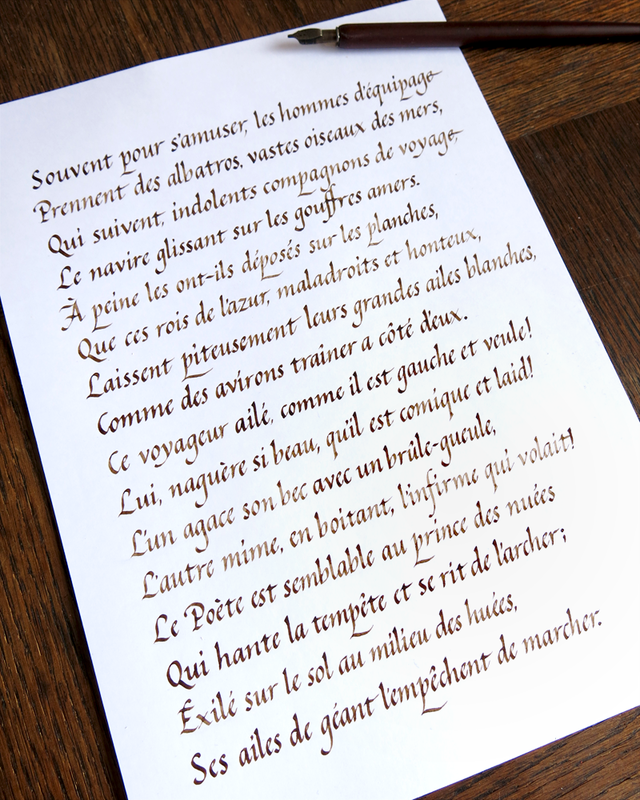 The ink is a neutral walnut, a rich brown that doesn’t catch the eye too much. The layout is simple and understated. To master a hand is the work of hundreds of hours. 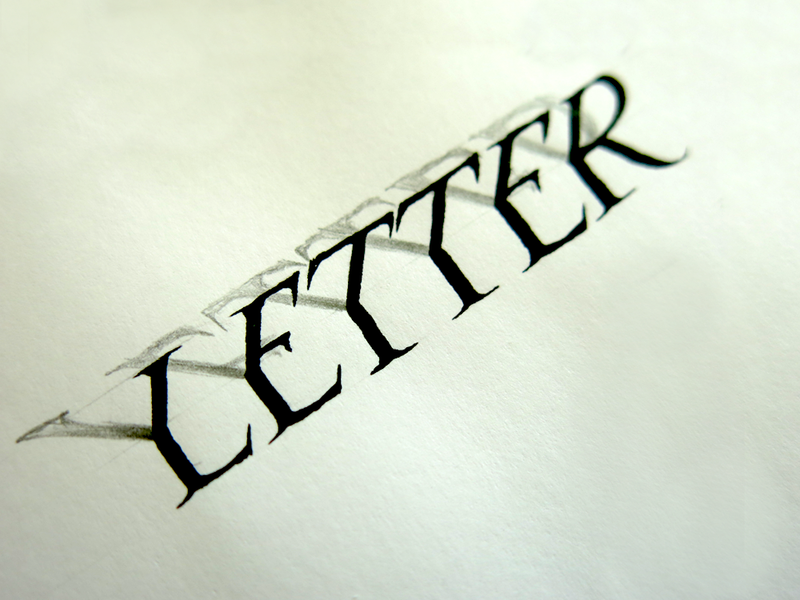 There isn’t a short cut to creating the perfect letter form every time: it’s down to training the brain and the muscles to be able to execute it perfectly. 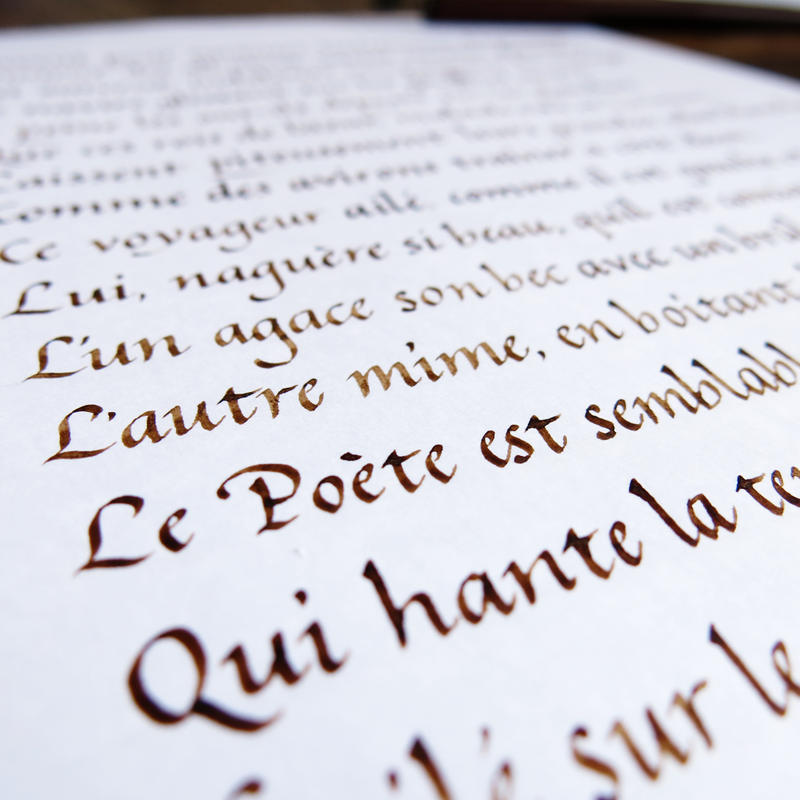 One can have a great understanding of what the ideal forms should look like, but in calligraphy, there is both art and craft. The art is the forms, and the craft is being able to create them. Speaking of understanding forms, lettering differs from calligraphy in the way that it is more forgiving on the execution side of things, but still requires a grasp of the underlying structure that makes letters what they are. Recently, I’ve been having some success promoting my work on Instagram, and so I made this piece to thank the (then) 500 people who follow my account. It’s a mixture of both lettering and calligraphy, using form of Italic calligraphy for the text at the top, under which the other words are lettered. I’m planning on using this technique in some pieces in the future, so if you enjoy it, you may see some more coming up soon. This entry was posted in Uncategorized and tagged Art, Baudelaire, Black and White, Calligraphy, Charles, Charles Baudelaire, Detail, Drop Shadow, Fineliner, Flourish, French, Hand lettering, Ink, Instagram, Italic, Jack, Jack Standbridge, L'Albatros, Lettering, Ornamental, Ornamentation, Poem, Poetry, Rapidograph, Roman, Rotring, Sans Serif, Script, Serif, Shading, Standbridge, Swirl, Technical Pen, Type, Typography, Word art. Bookmark the permalink.